It always surprises me how many people who use the web today take internet speed for granted. On the train ride home from Thanksgiving I discovered that AmTrak offers WiFi on its trains and I was elated, but that quickly transformed into frustration and despair when my connection became extremely spotty. I imagine this irrational frustration is a regular experience for many who were raised in an era with internet access in every home, and as of the last few years, around every street corner. We have evolved into high-maintenance prima donnas, victims of our privileged environment and culture, perpetually impatient and expectant, where the spinning ball of death can make anyone want to throw his computer against the wall. While I’m not here to advocate the use of Samsung Memory, I am here to explore one of the most important ideas in securing a consistently fast and dependable internet on a global level – the concept of network neutrality. Net neutrality is an idea that has never really reached mainstream audiences, and most internet users have never heard of it before. 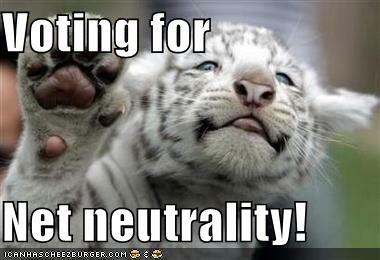 Like most things in life, net neutrality has become a concept we simply take for granted on a daily basis. Yet it very much shapes our entire online experience. So what is net neutrality? It is the idea that internet service providers (ISPs), the companies which provide you with internet access such as Comcast, Verizon, and AT&T, should be required to ensure that content from various websites across the net is delivered equally to you. Meaning, ISPs should not be able to restrict certain pieces of content, make certain websites run faster than others, or block certain websites entirely. All content, websites, and platforms would be treated equally. This way, companies such as Comcast, which owns NBC, could not tamper with internet speeds and content accessibility in order to favor their own content or the content of websites with which they have business partnerships. Many people simply take these principles as a given, but in fact this principle has been hotly disputed for years, and today we live in a world with a sort of quasi-neutral net that has grown out of a decade of developments in this ongoing debate. Freedom to access content – If you pay for high speed internet, you should not be restricted from accessing websites or certain content on websites. Freedom to use applications – As long as the application you want to use is not disrupting the network you should be able to use it. Freedom to attach personal devices – You should be able to attach any device you want to a connection you pay for (Comcast can’t sign a deal with Apple so that it will only provide internet to Apple computers). Freedom to obtain service plan information – Service plans should be transparent, and customers should know exactly what limitations are placed on whatever service they are using. Since 2004, there have been several bills and court cases which have set a number of precedents in the field of net neutrality. In 2005, Madison River, a telephone company, blocked Vonage VoIP services, which marked one of the first instances of ISP discrimination against certain kinds of content. the FCC put a stop to it, but did not establish clear regulations to set a strong precedent to prevent this from happening again. In 2006, Congress tried but failed to pass its first net neutrality bill, with ISPs and hardware makers against any sort of legislation and Internet content providers and engineers in favor. 2007 marked a similar failure. In 2008 another bill was introduced, and the FCC found that Comcast was interfering with its users’ peer-to-peer networking applications by blocking certain files. The FCC ordered it to end its discriminatory plan, and Comcast complied and then sued the FCC in 2009, marking one of the most significant cases in net neutrality to date. The court ruled that the FCC had overstepped its authority and failed to justify its mandate to regulate the behavior of ISPs on their networks, calling into question the FCC’s ability to take action to protect consumers on the internet. Subsequent to this case, the FCC has proposed a “third way,” Google and Verizon have proposed their own suggested policy framework, and Congress has attempted to pass another bill. As more court cases and legislation reshapes and redefines freedom of the net, the ideal of net neutrality remains a guiding force for many, from content providers and entrepreneurs, whose products benefit from a level playing field, to students and hacktivists, many of whom are inspired by the portrayal of the net as the final bastion of freedom in the world, a pure haven untouched by the corruption of the corporate world. But some reject this notion of net neutrality as some lofty goal, and argue that an unregulated net is either harmless or even beneficial to companies and consumers alike. Net neutrality has often been criticized by its opponents as “a solution in search of a problem” (an argument Verizon advanced in its challenge to the FCC’s Open Internet Order), and they argue that the discrimination of websites and content is an unfounded fear by many advocates of a neutral net, and that even if it were true it would be beneficial rather than harmful. Robert Pepper, senior managing director at Cisco Systems and an opponent of net neutrality, argues, “Without additional regulation, service providers are likely to continue doing what they are doing. They will continue to offer a variety of broadband service plans at a variety of price points to suit every type of consumer.” In Pepper’s view, government regulation is simply leading to market inefficiency. They also argue that prioritization of bandwidth is necessary for future internet innovation, and that certain sites which offer certain forms of content simply need more bandwidth than others. Today the debate continues as the net struggles to define exactly what net neutrality should entail and what degree of government regulation should be imposed on ISPs. At stake are the fundamental questions of freedoms of the internet, freedoms of the consumer, and freedoms to innovate, and regardless of which side of the aisle you might find yourself falling on this issue, it is perhaps one of the most important yet virtually unknown debates in the world today. But if you do care about maintaining a fast and fair internet, I strongly encourage you to stand behind net neutrality and spread the word .